Do you feel you get the vitamins or supplements that you need on a daily basis? Do you know that sometimes adding something to our routine like this can benefit your health or our lives in a magical way? 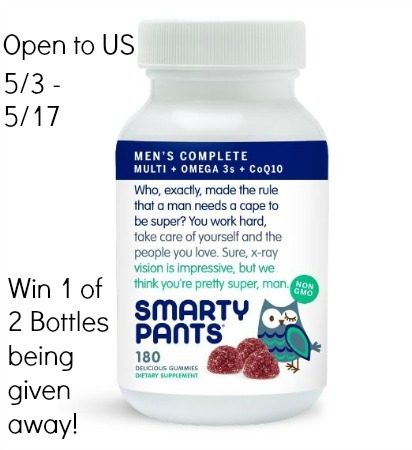 Tom over at Tom’s Take On Things understands how beneficial it can be, and wants to not only let you know what SmartyPants offers, but have a chance to win 1 of 2 bottles at the same time. SmartyPants offers its supplements in a tasty and easy to take gummy candy. No big pills or capsules to take, just a great tasting fruit flavored gummy. Tom did a review of the Men’s Complete formula here, and you can check out his previous review of the Adult Complete here as well. Open to residents of the United States, 18 years of age or older. SmartyPants in responsible for prize delivery. Starts 5/3 and ends 5/17 at 11:59pm EST. Participating blogs like mine were not compensated for this post. Facebook, Twitter, and Pinterest, are not associated with this giveaway in any way. Winner will have 24 hours to respond to winning email. Good Luck! Today my 5 year old and I took a walk in the rain, and saw 82 snails.